The 2012 Olympic Games are coming to an end this weekend. Every spare moment I've had over the past two weeks I've turned on the tv to watch the awe-inspiring performances of some of the world's most amazing athletes. At the same time, I've also sat in front of the television in awe of Samsung. Without exception, every single time I have tuned into London 2012 action, I have also seen a commercial for the Samsung Galaxy S III (S3). I don't know what Samsung's marketing budget was for these games, but I'm guessing it was astronomical. Whatever Samsung had to spend though, it seems to be working in terms of building recognition among "regular people" for their new Galaxy S3 phone. So much so in fact, that since the Olympics have started that people are even recognizing non-Galaxy S3 devices as the Galaxy S3. The prime example? My HTC One X has a serious case of mistaken identity for the S3. Prior to the Olympics, when I used in my One X in public I'd often get asked by people, What kind of phone is that? Since the Olympics have started, now I get asked things like How do you like your S3? or The screen on that Galaxy S3 looks nice! at which point I have to break the news that it isn't a Galaxy S3 but is actually a HTC One X. This isn't a one off occurence. This scenario has played out for me over a dozen times now since the Olympics began. It's to the point where I actually feel kind of bad for HTC. As usual, I always relate things back to BlackBerry and this experience brought a couple of marketing 101 observations to mind that I thought were worth noting. The first, of course, is that advertising works. No big surprise. If you spend enough $$$ advertising a product, people can't help but notice. Hopefully BlackBerry's new Chief Marketing Officer will be able to stretch their BlackBerry 10 marketing budget as far as they can. The second, and more pertinent observation for the purpose of this post, is the need for manufacturers to differentiate and create a unique identity for their mobile devices (and gadgets in general). 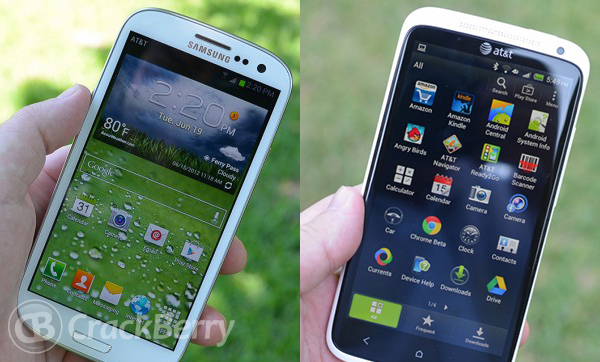 Those of us who follow mobile and tech stuff regularly will look at the photo above and see two clearly different phones - the Galaxy S3 on the left and HTC One X on the right. But to the average consumer who watches a Galaxy S3 commercial and then sees either of these phones for the first time in real life (without the side by side comparison) could easily assume they are that device. In this case they're both BIG touchscreen phones with rounded corners and white casings. Those are the memorable at-a-glance details that will be remembered from a commercial. There are lot of differences when you look closely, but at a glance... those are the distinguishing features that jump out at you. Over the years, BlackBerry has always enjoyed a position of having a truly iconic design in mobile. When it comes to mobile devices with a full physical keyboard, they own it. Most people who see a phone with a full keyboard just assume it's a BlackBerry, even if it's not. In the realm of full touchscreen devices, BlackBerry doesn't enjoy that same position. For a while there it felt like Apple owned full touchscreen recognition the way BlackBerry did keyboards - that every full touchscreen phone with rounded corners was considered by the average consumer to be an iPhone. I think since the iPhone 4 / 4S design hit the market though, that Apple has lost that all-encompassing recognition a bit. The look of the iPhone 4 / 4S is so distinct that it opened up space for other competitors to really differentiate from it. This isn't a bad thing for Apple - everybody recognizes an iPhone. I just mean that people don't mistake non-iPhone devices as iPhones like they used to prior to the iPhone 4 design. Samsung is now beginning to prove that by spending enough money they can hopefully own all the recognition in the supersized full touchscreen segment. If you see a person on the other side of the room with a big clean-looking phone in hand that's not an iPhone, they want you to think it's an S3. Based on my experiences of the past couple weeks, I'd argue they are on there way to getting there. We have yet to see what the first BlackBerry 10 phone will look like, but I really hope that it has a strong and unique identity when it launches. Especially the full touchscreen version, where RIM will need it to uniquely stand out from the crowd. The last thing I'd want to see them do is pull an HTC here, and put out a device with a weak identity such that it's easy for it to be mistaken for a competitor (who spends more money on advertising). A couple of pre-release designs have shown up over the past year, and we do have the BlackBerry 10 Dev Alpha to look at too, but I'll reserve comment until we see an official design. With the BlackBerry PlayBook tablet, RIM arguably went to market with a design that could have had a stronger design ID. BlackBerry wanted to put to display operating system's user interface as a key design element, so put the hardware in the background to keep the attention on the glass. It was an understated hardware design, which I personally liked, but it didn't have a unique enough ID. When Amazon subsequently released the Kindle Fire, their design was so similar that both tablets looked the same to the average person. From across the room there's little chance of telling them apart. And because the PlayBook's design ID was so basic, you almost can't even blame Amazon for copying RIM on it. I really hope BlackBerry comes to market with a BlackBerry 10 phone design that is uniquely BlackBerry and still stands out from the competition, regardless of the ad spend by their competitors. We have to wait another ~ five months to get our hands on a BlackBerry 10 phone. When I finally get my hands on one, the *LAST* thing I want to happen is to have somebody walk up to me and ask if it's a phone by another manufacturer. I'd lose my sh!t.